What exactly is going on in a natural pond? A pond ecosystem consists of different tiers, with the water forming the foundation of the ecosystem. These levels are dependent on the other for health and growth. 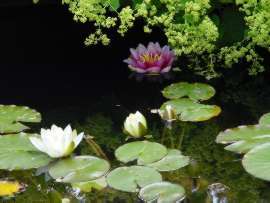 In the backyard pond you create, the same relationship exists as in the natural pond. The difference lies in human intervention to provide plants, filtration, and fish to speed up the natural aging process. Bacteria, diatoms, phytoplankton, protozoa, and plants (including algae) - In a pond you create, your bio-filter gives bacteria a medium in which to grow so it can turn harmful ammonia into more neutral fertilizers (see Nitrogen Cycle, below). Zooplankton (daphnia and rotifers) - These tiny creatures drift through water, feeding on algae and protozoa from Tier 1. Larval insects, worms, leeches, snails, and insects - Members of this tier consume zooplankton as well as individuals in Tier 1. Amphibians (frogs, toads, salamanders, and newts) - These consume some of the lower tiers. Salamanders and newts frequent natural ponds much more often than backyard ponds, but most likely frogs will find a home in your pond. Fish - Most fish are omnivorous, which means they will eat just about anything. Besides any food you give them, fish will also eat all members of the lower tiers. Birds, reptiles, snakes, turtles, and mammals - These travelers are the connection to the surrounding environment, both for natural ponds and for your backyard paradise. Although predators may be unwanted, they do represent a vital part of the ecosystem. All ponds begin to age the moment they are formed. As a pond ages, the nutrient level and amount of organic material increases. This aging begins when algae begin to grow, releasing oxygen during the day and carbon dioxide at night. Algae provide microscopic creatures with a food source, and as those creatures begin to thrive and die back, they become nutrients for higher orders of plant life. These plants help balance the nutrients and waste and deliver even more oxygen into the water, allowing higher levels of the ecosystem to thrive. Zooplankton feed insects and the other creatures of tier three, which in turn feed the amphibians in tier four. All of the tiers below tier five help fish thrive. Fish create waste and phosphorus (from their food) which cause plants - including algae - to grow. Thus perpetuating the cycle. A pond is a small area of still, fresh water. It is different from a river or a stream because it does not have moving water and it differs from a lake because it has a small area and is no more than around 6 feet deep. Some ponds are formed naturally, filled either by an underwater spring, or by rainwater - sometimes known as ‘dewponds'; other ponds are man-made. If a pond is to be a successful habitat it must have plants growing in it. They provide food, oxygen and shelter for the animals. 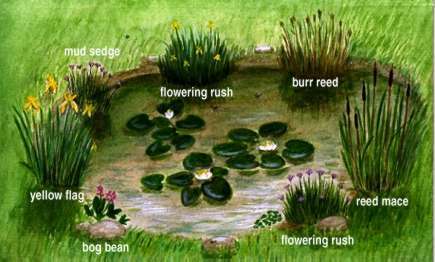 Green plants need sunlight to make their food (photosynthesis) so a pond in the open will be more successful than one in the shade. The smallest plants in a pond are the microscopic phytoplankton and these provide most of the food in a pond. The phytoplankton and larger algae form the first part of the pond's food chains. Plant-eating animals - the herbivores - eat the plants and the herbivores are eaten by carnivores (meat eating animals). 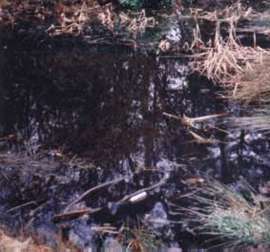 Pond vegetation grows in areas called zones. Plants such as great willowherb and meadowsweet grow in the bankside zone: they like damp places but are not true water plants. The emergent plants grow nearest to the pond edge in the marsh zone e.g. yellow iris and mud-sedge. These fringing plants provide good hiding places for some pond animals such as young frogs, and the tall stems are used by dragonfly nymphs when they climb out of the water before emerging as an adult. In the aquatic zone live the truly aquatic plants. Some of them float on the surface with tiny roots dangling in the water e.g. duckweed and frogbit. Others have their roots buried in the mud at the bottom of the pond and their leaves float on the surface e.g. water-lilies and crowfoot. Then there are fully submerged plants such as starwort and Canadian pondweed. These produce most of the oxygen so it is important that they receive plenty of sunlight (oxygen is produced during photosynthesis). If the plants on the surface are completely covering the pond then some of them should be pulled out or the submerged plants will suffer. Some species of pond plants, such as the water-violet, are becoming very rare indeed. A pond is a fascinating habitat to study, a good one teeming with a great variety of both animal and plant life. The community (all the species of animals and plants present) in one pond may be quite different from that in another, even if the ponds are close together. This is because most pond animals cannot travel from one pond to another. Also the water temperature, oxygen content, water cleanliness and the material of the pond bottom have an influence on the kind of life present. In any pond it is essential that there is a balance of different kinds of organisms so that there is enough food for them all to live and reproduce. More than 1,000 species of animals live in ponds - although you are unlikely to find all of them in any single pond. Almost every group of living creatures is represented, except starfish which live only in the sea. 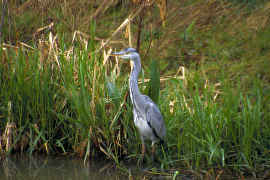 In a large pond you may find mammals such as water voles and water shrews - and birds like ducks, herons and kingfishers. Even the smallest pond will have a population of amphibians (frogs, toads and newts), small fish e.g. sticklebacks, and a huge variety of invertebrates (minibeasts). Some of these are herbivores such as water fleas and snails, whereas others are aggressive carnivores, hunting down their prey, the unfortunate herbivores! One of the largest invertebrate predators in a pond is the great diving beetle - no tadpole is safe when one of these hunters is around! Many different food chains are to be found in a pond because each animal eats different things. As with any habitat, if ponds are in danger of disappearing, then the wildlife in them is also endangered. For centuries, ponds were an essential part of people's lives. The water was used by both humans and animals. As technology advanced and water became available at the turn of a tap, many ponds were neglected. Since most ponds were man-made, when abandoned by man they were taken over by nature; plants at the edges took over where there were no farm animals to trample them down and some ponds ended up as marshy bogs. Fallen leaves choked ponds and the oxygen vital for pond-life, was used up as they decayed. Other ponds have been destroyed by pollution or drained and filled in to make way for buildings and farmlands. Ponds of our countrysides are now an ENDANGERED HABITAT! The water in a pond must remain clean if it is to provide a healthy environment for the organisms (animals and plants) living in it. The natural waste from the living and dead organisms is ‘recycled' by special tiny organisms called bacteria. Plenty of oxygen is needed for the bacteria to ‘break down' the waste. The pond can take care of its own waste - it's people who cause pollution! The most noticeable kind of pollution is the dumping of rubbish - anything from old cars and cans to bikes and bottles have been found cluttering up ponds. Such thoughtless behaviour not only makes the environment look so unsightly but it may also destroy pond-life. Perhaps the most serious threat to ponds is chemical pollution as a result of modern farming methods. Over the years fields have been sprayed with pesticides to rid the crops of pests. However, rain often washes the excess chemicals off the crops into nearby ponds, streams or rivers, poisoning some of the animals living there. Fortunately, these poisonous chemicals are not used so freely now and, hopefully, this problem will gradually be reduced. Another, equally serious, problem connected with agriculture is the use of artificial fertilisers. Powdery chemical fertilisers, containing nitrates, are put on the crops to help their growth but they can also be washed off by rain into nearby ponds. They do not poison the wildlife but the rich supply of nitrogen causes the water plants, especially algae, to grow very quickly. 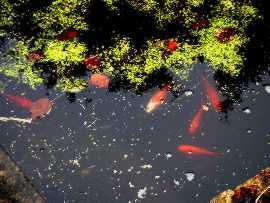 The plants use up so much oxygen during the night and when they decay that there is none left for the other pond-life. The growth also prevents sunlight reaching the organisms below. Eventually, all the algae die leaving a stinking, decaying mass. The case of excess nitrates in water is called eutrophication. Have a look around your neighbourhood and see if you can find any ‘wild' ponds. If you think a pond needs improvement e.g. rubbish or plants removing, perhaps you and some friends or family could try to renovate it. It is best to ask for advice and help on pond management from professional organisations. By the way, ponds can be deep, so take great care and never go alone! It's best to persuade an adult to go with you and help. Pond-dipping is a lot of fun and a good way of finding out just what is living in a pond. A wide variety of creatures would indicate that a pond was healthy. However, always remember that the most important thing is the safety of the animals. Return them to the pond as soon as you have finished studying them. It is fascinating to collect frog or toad spawn to watch it hatch but return most of the tadpoles to the pond. If you keep a few tadpoles to observe their development, look after them carefully and return them to their pond when they have grown legs. Create your own pond: These are obviously much appreciated by animals such as frogs and dragonflies whose countryside ponds are disappearing. A garden pond designed with wildlife in mind is an exciting and worthwhile project to undertake - and not difficult if you have someone to help you. You will be surprised just how quickly animals are attracted to the newly-filled pond. Other garden residents will welcome the water for bathing and drinking. You may have birds, hedgehogs, mice, foxes and bats making good use of your pond. As well as providing a much needed home for wildlife, you will enjoy watching your pond improve as time goes by. A seasonal diary of pond events makes a good project.